So I haven't even posted to this blog once since I started it, so I figured I would give it a try now! Life is busy as usual but fun and exciting with two small boys! This was a busy week for us all as we had several out of town trips. Monday I worked and the boys went to the Dever's. 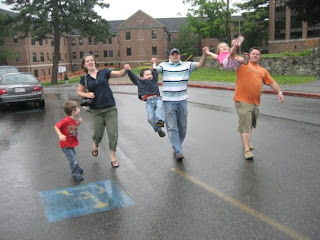 Jen Devers is a good friend of mine who has three children of her own, Billy age 7, Emily age 4, and Matthew age 2. She lives next door to my parents, and across the street from us! 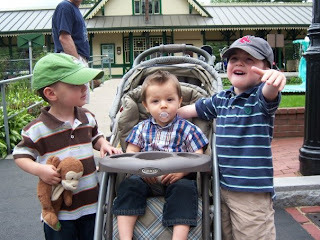 Jack and Ethan love going there and Jen is a wonderful caretake for them. Tuesday the boys and I had a quiet morning at home, and then I woke Adam up at 1pm to watch the boys (he is working the midnight shift so he sleeps in the mornings when he gets home, usually from 6:15am till 1pm). My mom and I had planned a trip to go shopping and out to dinner with my sister, Liz, who is 8 months pregnant. Our closest mall is in Concord, NH which is one hour away. Liz lives in Plymouth, NH which is in an opposite direction, so she met us there. We had a blast shopping mostly at Target where we got Liz everything she needs for her baby girl! It was fun eating Target popcorn and picking out the necessities (diapers, wipes, baby soap, bottle brushes, etc.) and a few cute girlie things (summer hats, tights, bathing suit and cute shirts). After Target we went to the mall and shopped at Old Navy and then on to dinner at Liz's FAVORITE restaurant, Applebees. We laughed and laughed at the stupid things but it was just what we needed to make our girlie time together special. Liz looks phenomenal for being 8 months pregnant but we have an ongoing joke that for the first time Liz might actually weigh more than me! The only bummer is that she is very pregnant and I am not! Wednesday we went down to Massachusetts to visit Grampy Gaudet in the VA Hospital in Bedford. We had a great time seeing him. Craig, Sarah and Sam and Kate arrived at the same time so we had a nice visi t together with Grampy. He is a sweet man with such a sweet spirit. Jack was very talkative and told Grampy all sorts of funny things. Grampy asked is he ever stopped talking :) After we left the VA we went to GG's house (Great Grammy Gaudet) for dinner. Adam's cousin Meredith came with her husband Konrad and their cute baby Simon, who is 6 months old. We had a nice dinner and visit and Jack even sang his "ABCDEF, Jesus Died for You and Me" song. We always laugh when he sings the last line like this, "XYZ, A home etermally." My Dad says "etermally" must be in Italy. Jack was very excited to see everyone and Ethan was a good boy despite the lack of naps. Thursday was our family day, the only day Adam and I were both home together with the boys (where he didn't have to sleep from working the night before!). 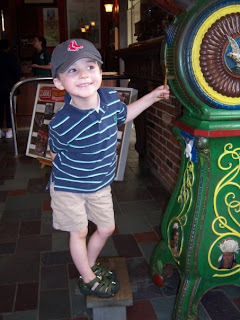 We went to Clark's Trading Post in Lincoln, NH. Liz and Max met us there, since they live only 20 minutes away from Clark's. It took us about an hour to get there. Jack and Max were so excited to go on the train ride, but once the scary Wolfman made his appearance poor Max was upset and cried the rest of the ride. After the train we saw the famous bear show and then went into the rustic crooked house. The tour guide talks about the family that lives there and when she showed a picture of the son, who was old and wearing dirty torn clothes, Jack yelled out, "Hey, we saw him on the train ride!" thinking that it was the wolfman. We all laughed, but Liz especially got a kick out of that and didn't stop laughing for a long time! Max and Jack enjoyed playing in the wolfman's old car and the cage they could climb in. Then Adam and Jack went on the water bumper boats, and got soaked. Thankfully Jack was not too upset about this! We went home after a fun filled day and then had dinner at my mom's and church. Everyone was exhausted and slept great that night! Friday is back to work for me and Adam is home with the boys. He goes back into work tonight, leaves around 9:15pm so we will have to find time for him to get a nap before he leaves! Jack just talked to me on the phone and informed me that he was "Paying bills and when he gets older he's going to work too." So that is the scoop on us for now. 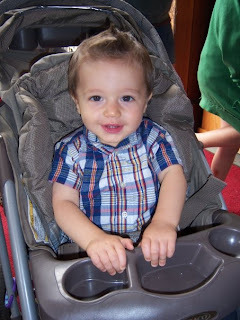 Ethan has four new teeth almost in and is very close to walking. He can take a couple steps but is afraid to go too far without holding on to something. I will try to be more faithful at updating the blog! Pictures coming soon.